Looking for wildlife? Poachers? Wild and crazy trespassing teenagers? Never miss any activity on your property with the Trail Cam pro. With its crisp and clear video and 5MP still images, all contained in a weather resistant case, you can be sure any and all activity is captured and stored. Even pitch blackness is not problem with this Camera's excellent infrared night vision system. 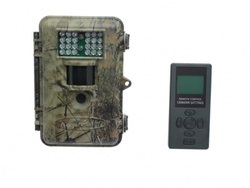 Its camouflaged shell makes it perfect for mapping out your hunting trails or for home security.